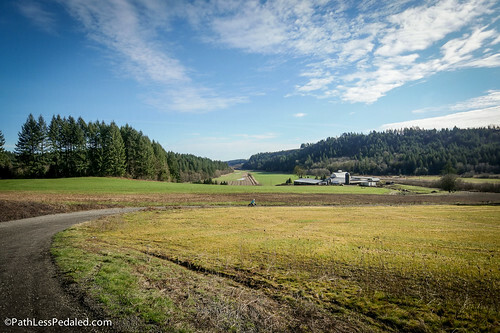 Stub Stewart is usually an end destination for local bike tourists, but it also makes a great basecamp for further gravel road exploration. 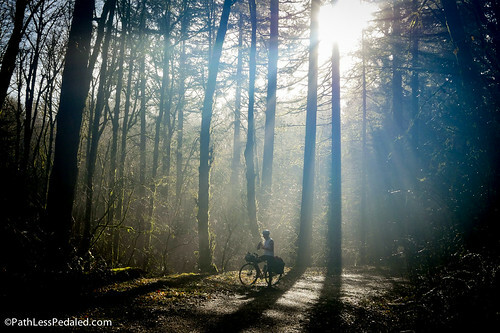 Stub Stewart State Park is a well-known bike touring destination for Portland-area bicyclists. 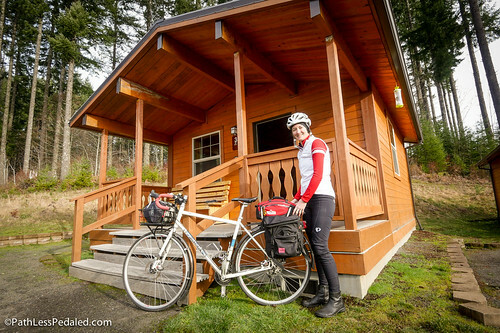 Located off the Banks-Vernonia Trail, it is a relaxing car-free experience to gently ride up the rail trail through the forests in the foothills of the coast range. 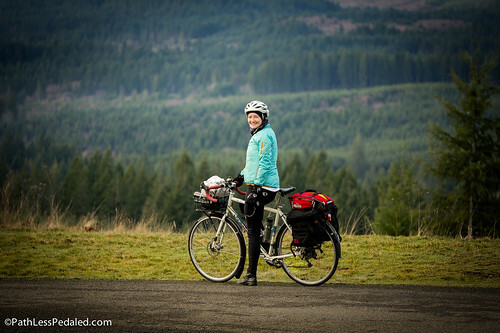 It is also featured in the Tualatin Valley Scenic Bikeway video we filmed. We’ve ridden there about a dozen times and have always treated “Stub,” as it is affectionately called, as an end destination for a quick bike overnight. Hitting the gravel early on Saltzman Rd. Over the last year or so, we’ve become more interested in mixed terrain road riding. After joining the Gravel Working Group on a recon ride a few weeks ago, and getting a sample of some of the great quiet roads in the area, we decided to try treating Stub as a basecamp for further adventure. 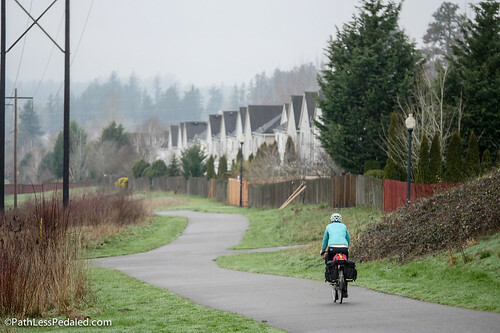 Usually, we take the Max out to Hillsboro and ride this route, which puts you on about 10 miles of quiet country roads before the start of the Banks-Vernonia Trail. We actually prefer this route to the official Scenic Bikeway route. It is a bit shorter, a lot less traffic, with fewer major street crossings. If you’re a beginner bike tourist or even a family, it is probably the recommended route. We wanted a few more miles in our legs so we took this route from Portland all the way to Stub. It was our first time riding there without taking MAX. 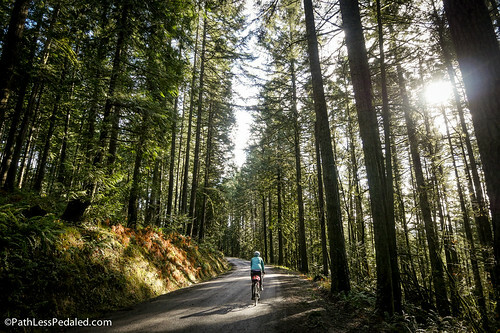 You essentially leave Portland on HWY 30, climb over the West Hills via Saltzman, ride about a mile on Skyline, descend via Springville, and weave your way through a strange tapestry of suburban trails to country roads. Riding up Saltzman to Skyline. The route was circuitous and strange, but generally low stress. At one point, you make a left on a gravel service road for 500 feet beneath some power lines. It looks like you are going the wrong way, but you’re not. If you attempt this route, I’d highly recommend taking a GPS, especially if you are not familiar with the trail system. When you get to Banks, it is pretty straight-forward. 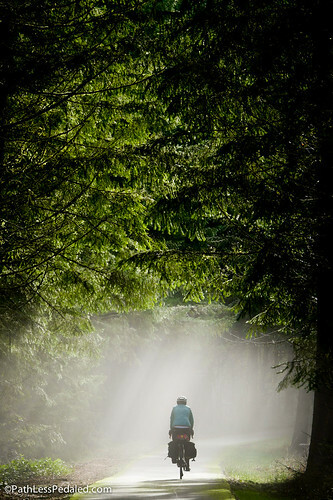 Hop on the trail and head into the hills. Through an odd network of suburban trails. If you need a lunch break, the Banks Cafe makes some solid hamburgers (GF bread available), has free wi-fi and even some craft beers on tap! Not bad for a tiny town. A little further down the street is the Trailhead Cafe with a green bike out front. They have coffee and focus on more breakfast-type items (the breakfast burrito was a good 2nd breakfast for the ride back to PDX). We got to the cabins just as the sky opened up. Perhaps one of the best-kept secrets about Stub is its cabins! We’ve tented at Stub, but during the colder months, the cabins are really the best option. They are all wood and are outfitted with a futon, bunk-bed, a small dining table, and lamp. The have heat and electricity inside, as well as a fire ring (wood is available from the camp host) and picnic table outside. Bathrooms and hot showers are a short walk to a separate building. They all have a porch with a bench that overlook the coastal range (for best views, book cabins 11 or 12!). Warming up with a little #coffeeoutside inside. If you are into mountain biking, there is a trail network that you can connect to from the cabins. If you are into disc golf, a short walk down the hill and you are on the course. The price is more than reasonable at $44 a night. They are popular during the summer months and weekends, but if you have a flexible schedule, going midweek almost ensures you’ll have a quiet stay. Each cabin has a fire ring and picnic table. Probably the best $40/night view in the greater Portland area. 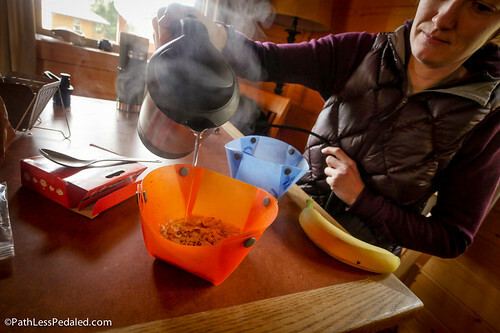 As a side note, there are no kitchen facilities, so bring your camp cooking gear. 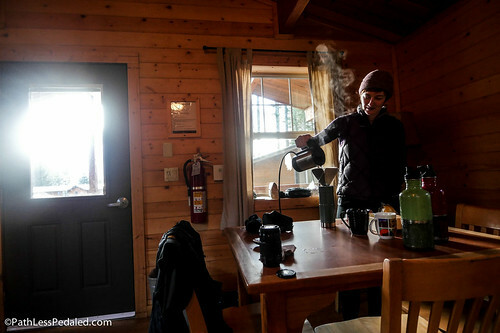 We brought along a small electric kettle, which was awesome for not only making coffee, but for cooking dehydrated mashed potatoes and oatmeal. The only caveat is that, if you come on bike, be prepared for a one mile slog up-hill to get to the cabin village. While nothing terrible, the road from the trail to the cabins tops out at about 9% grade. If you are hauling kids or a super heavy load, there’s no shame in walking and enjoying the view. 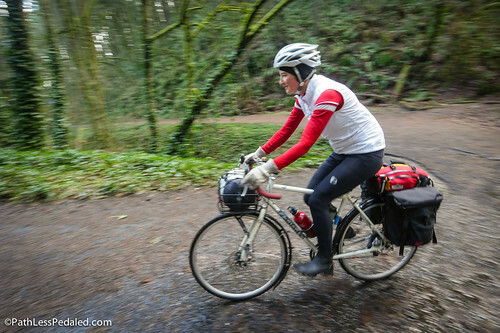 For us, riding in the area around Banks and Vernonia is relatively undiscovered terrain. We are car-free, so just getting out to Stub is essentially a day ride. By treating the cabins as a basecamp, it has opened up our range of roads to explore. There are two routes that have been mapped out in the area by a friend of ours, a local gravel road connoisseur. One of them starts from Banks, and a slightly longer one starts from Vernonia. Having ridden the one from Banks with the recon group and knowing that it was a good ride, we opted for a modified version of that one. We had a chilly descent down to the Manning Trailhead and picked up the route there. After crossing the 26, we hopped on Hayward Rd, which essentially climbs in earnest. It is initially paved but quickly turns into a great gravel country road. It is important to note that, although the roads seem blissfully empty, you should still generally be aware of the errant vehicle which will definitely not be expecting you. There are a few houses and small farms along the route and more than a few dogs. For the most part they kept away, but there is a chocolate brown boxer that lives at the top of a hill that got a little bitey during the recon ride a few weeks ago. I was carrying a friend’s Dazzer as insurance. If you are uncomfortable around dogs, this is worth noting. Generally, having some sort of deterrent or plan if a dog gets a little over anxious is a good idea. The roads are not flat, but the views are rewarding. The route climbs at a fairly steady pace, with the occasional 14% grade spike. You’ll meander along a rolling ridge before a fast descent to Cedar Canyon Rd that you take into Banks. The gravel roads this time of year are hard packed and fast! 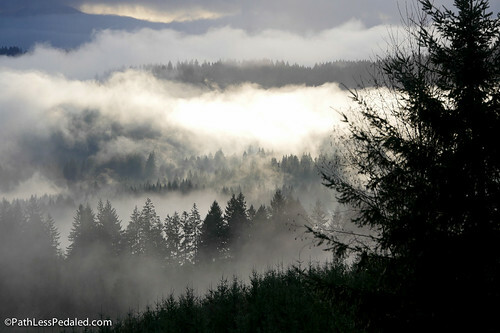 Conditions will change as things dry out, or if there are logging trucks using the roads. I was riding on 33.3mm Jack Brown tires and they were perfect. Laura was riding on 28mm Panaracer GravelKings, which is probably as small as you’d want to go. About as bucolic a bike ride can get. After another lunch in Banks, we headed back up to the cabin. Although it was sunny, it was still cold, so we decided to call it a day. The area definitely calls for more exploration when the weather is warmer and the days are a little longer. The next day, we left Stub and rode back to the Hillsboro MAX station and took it back to Portland. We wore all our layers on the cold and foggy descent. 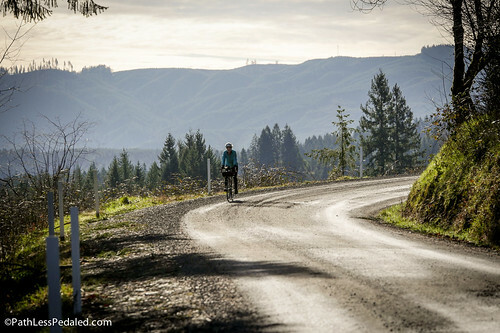 Stub Stewart is a great bike touring destination, but it is also an ideal basecamp for gravel rides. We, admittedly, barely scratched the surface, but are planning to go back again and spend more time riding other routes. 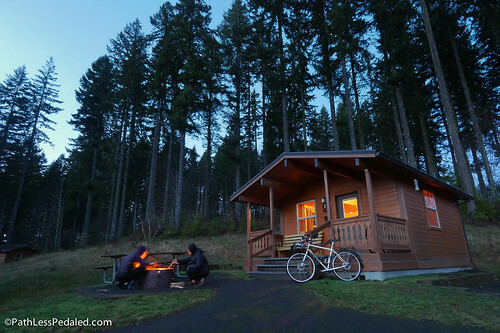 It is easy to imagine some awesome 3-night cabin stays in the summer when the days are long, riding loops around the area and ending every evening with a campfire, cold beers, and watching the sunset behind the mountains! Great write up and gorgeous photos Russ. I’m really looking forward to exploring more of this area myself. And using the Stub cabins as a base camp is a perfect idea. 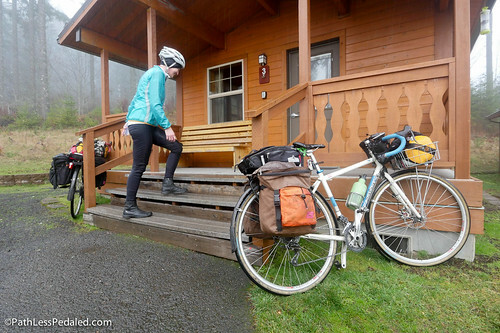 You can literally point your bike in any direction from the cabin and open yourself up to untold miles of backroads. You guys should put that Snow Peak dripper on your Amazon site. I am going to be trying out the Helix first, but if I end up with the Snowpeak, I would like to buy it through you. Great write up. Thanks for post the route you took from Portand to Banks. Hi, I really enjoy reading your posts and your presence in my Facebook feed is one of the most welcome ones. This is just the sort of post I needed in the dark and dingy months of January. I’m working away from home in the middle east so no bikes – when I get back to the UK i’m back with the bikes but right now, its full of snow! So a bit of inspiration like this post is just what I needed. I love reading about your travels especially in the Portland area – is there somewhere you could link to where we could find some maps of the places you write about – even a link to Gmaps would help to complete the experience. They way you describe your riding experiences paints a very enticing picture of the landscape, environment and the facilities in the area – I’d love to make a trip out there and for me pouring over maps for hours on end is part of the planning.Thanks again! When we were touring the coast, I swore that regardless of the day’s terrain, somehow every campground involved one last climb you hadn’t bargained for. I live S of Portland. I have the good fortune of riding this trail and the coast route often. Nicely written post. thanks. great write up, many thanks. this is a wonderful area to explore and dairy creek out of manning has some great cutthroat fishing if you pack a rod and trout season is open. i’ve found that a squirt from a water bottle stops dogs in their tracks. also simply saying “good boy”, “good dog” or “you go home” gets enough of a pause to get past them or just defuses the encounter. Good write up on our area. I assume you ate lunch at the Trailhead Cafe?? Again thanks for a great discription of the Banks and Vernonia area. Beautiful written and illustrated! thanks for sharing! Your link mapping out a stress free route from Hillsboro MAX to Stub Stewart is not working! I really want to try this with my partner but she prefers as stress free as possible. Can you please send an updated link with the route? It would be SUPER appreciated!!! Wesley….will look into this and update the link.